All France Motorhome Hire vehicles are fully equipped with everything you need for your trip so we don’t offer many optional extras but if you want an “access all areas” solution for getting into some of France’s older and prettier town centres, you might like to hire some bikes. Bikes add a great deal of flexibility to a French motorhome trip and the whole country is peppered with dedicated cycle path to explore. They also come in handy for nipping to the Boulangerie for the all-important croissants and bread each morning. We rent adult, unisex, hybrid bikes (suitable for most people between 155cms and 195cms in height). The bikes fit onto the bike rack fitted to all our motorhomes (a maximum of two bikes per vehicle) and come with a combination bike lock. Adult, unisex hybrid bikes: €4 per day per bike up to a maximum of €159 per bike, per hire. Bike hire is subject to a separate Rental Agreement which must be completed at the depot during check-out. A separate security deposit of €250 per bike is payable at check out. 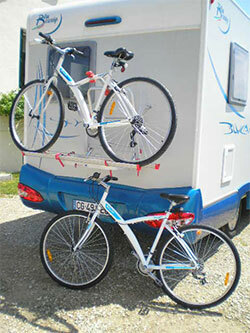 There is no need to book your bikes when you book your Campervan. We will send you a booking form for extras shortly before your hire.